Today the kids and I began our long spring break adventure. For two weeks we are road tripping down Florida! Should be a blast. Bryan is back home holding down the fort… and busy with an exercise at work. Best we aren’t around anyway. 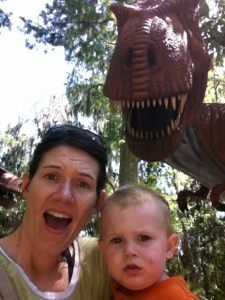 Our first stop after just under 4 hours in the car was Dinosaur World in Plant city. It’s about 20 minutes east of Tampa. This place has popped up a time or two in our potential radar, but we’ve never stopped. 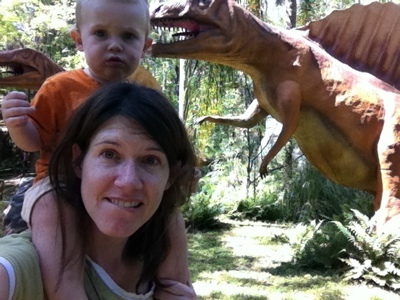 What I knew of it was that there were life sized Dino replicas (statues) along a woodsy trail. Well I’m here to say it is not just a run of the mill roadside attraction. 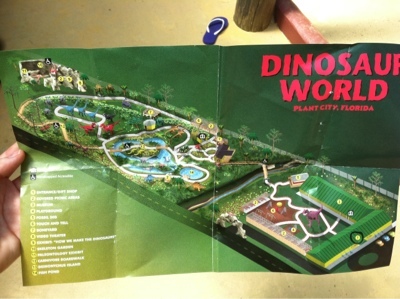 It was quite enjoyable, and there is more than just the dino lookalikes. We spent 3 hours with prodding; I’m sure the kids would’ve lasted longer. The fees are reasonable, and they offer a military discount which is a plus. The entrance was via a giant gift shop, though, which sucked both of the kids in opposite directions towards every dino toy imaginable. Not bad prices though. Avi couldn’t put down a giant ankylosaurus and Zoe loved the big squishy pteranodon. Once I rounded them up and got tix we stepped through the doors into dino world! I have to say I expected it to be a bit cheesy and run down, but I was pleasantly shocked to find a well maintained and super clean and tidy park. There are two playgrounds and lots of covered picnic space being watched over by some giant sauropods right at the beginning; spent about 10 minutes there to get the kids unwound from the long car ride. Then it was on to the main attraction. 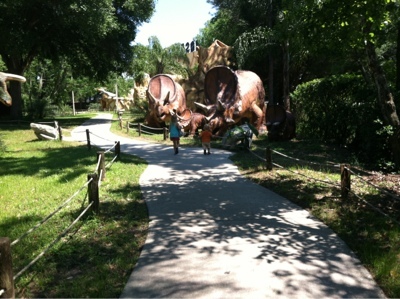 As we crossed a bridge onto the dino trail both Avi and Zoe were running to see the dino’s. They are everywhere! All different kinds, too. We mostly ran (i chased) from dino to dino for the first half hour along the trail until coming upon the “dig site”. This is a roofed sand pit with a permanent faux fossil underneath and plenty of plastic shovels and brushes to accommodate little paleontologists. Zoe was, of course, in her glory and did a video tour (on our YouTube channel). Avi was content to go up and down the stairs of the parent viewing platform most of the time. Back on the path we encountered many other dino’s. We thought we recognized many species only to find they were actually some obscure relative. Oh well, there are scan codes for smart phones on many of the info boards that link to greater detail. Cool! We found a cave that was playing a dino documentary and had a display on how they created the statues. The best part of the cave was that it was also a covered picnic area. We settled down in the coolness and had an apple. So far today we had eaten breakfast and snacks in the car… So now at 2 in the afternoon it was time for lunch. Moving on from the cave was the carnivore boardwalk complete with bloody scenes of meat eaters feasting. There was lots of red paint and teeth, but I wouldn’t say it was realistic enough to phase my kids. In fact, Zoe mentioned that it was a rough day or some dino’s getting eaten. “except the protoceratops. They were defending themselves well.” Which was true. It was the only display where the prey was still alive and apparently winning. Beyond this was another nice reprieve: the koi pond. Both kids had fun tossing fish food at the giant gorgeous fish. Then, it was more dino’s! By now the kids had slowed to a manageable pace and we sauntered as we took in the center part of the trail. Here we’re the well known dinosaurs we know and love! Brontosaurus, t-rex, stegosaurus, triceratops. Zoe named them all and Avi squealed babble-ish words or roared if they had teeth showing. Avi also ran around chasing the quasi-tame squirrels. Eventually we wandered out of the dinosaur world forest back into the open entry area courtyard. At 3:30 there was a fossil dig that couldn’t be missed so we occupied some time playing on the playground, but it got to hot. We snacked, but weren’t too hungry. So we stopped into the little museum. It is mostly a display of a personal (but substantial) fossil collection. The highlight being a whole Allosaurus foot. Zoe was interested in some of the displays she recognized- eggs, the foot, trilobites, while Avi ran ahead playing his irritating game of ‘catch me’ … until we heard a low rumbling roar. From then on we stayed together as we got closer to the rumble. We popped around a corner face to face with a baby brontosaurus. It was moving and there were more dimly lit animatronic dinos. Zoe dug it; Avi clung to me afraid to be eaten. Well that successfully took the 15 minutes necessary to be ready for our fossil dig. The fossil dig site is a big raised trough full of sand and tiny fragments. Each kid gets a sifter and a little container to collect fossils. After 15 minutes you may keep 3 fossils. It was fun. Zoe took it very seriously. She found lots of fossils and had a tough time deciding on her 3 shark teeth to keep. She even knew that the black one was more special and ancient. 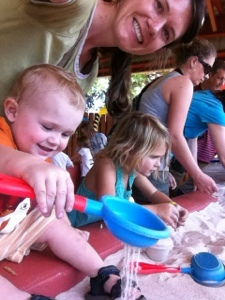 Avi loved sifting the sand and didn’t notice the fossils. It was fun for him to just play. I picked 3 for him: a shark jawbone, a ray tooth, and a fossil snail. The employee told us what we collected and put them into a tidy plastic bag. Time to go. 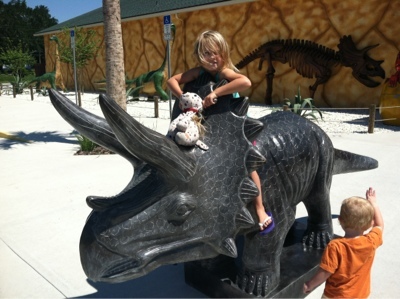 Dinosaur World is a worthwhile trip for any family with budding paleontologists or dino lovers. Only one complaint: I so wish the playgrounds had a big canopy over them; slides were super hot in the afternoon sun. Hot and worn out we wandered back to the car and I drove to IKEA. I had an exchange from our visit last weekend to the one in Atlanta and it was a good place for some cheap healthy(er) dinner. Avi napped in the car for a bit as we drove from Tampa to the Little Manatee River state park. We snagged the last campsite: number 17. 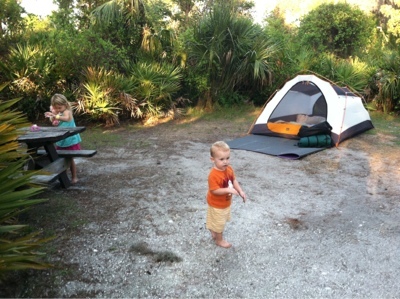 Its a nice large spot in a well kept small campground with only 24 sizable sites. Spent the evening setting up, cooking some noodle with corn and peas ( my Thrive stuff is perfect for camping), and chasing down Avi. He has a thing for running out into the road and then continuing down it. He just laughs with joy as I chase him, too. It’s funny once. Zoe, on the other hand, occupied herself for hours playing with her ponies in the dirt. By the time the sun set she had dug a city for them around the whole site. It’s a nice cool night. There are crickets to listen too but also the low swish of I-75 in the not to far distance. Tomorrow we will make it to the Everglades.